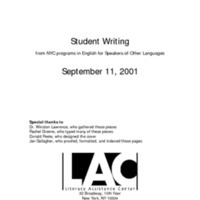 [pdf document, Literacy Assistance Center, New York, Fall, 2002] When the Literacy Assistance Center invited students in ESOL programs throughout New York City to submit the writing they had done about the effects of the terrorist attacks of September 11, the response was overwhelming. More than 120 students from 29 programs submitted their work. The Literacy Assistance Center, www.lacnyc.org, is a not-for-profit organization that provides essential referral, training, information and technical assistance services to hundreds of adult and youth literacy programs in New York. “Student Writing: September 11, 2001: Index,” September 11 Digital Archive, accessed April 18, 2019, http://911digitalarchive.org/items/show/2875.